Editor’s Note: Buddy already has his football, but he will be honored long-distance during the FWAA’s Annual Awards Breakfast om Jan. 9 in Tampa. RUSTON, La. — On the fake turf in Louisiana Tech’s otherwise empty Aillet Stadium, his wheelchair toed the goalline on this mid-morning Monday. O.K. 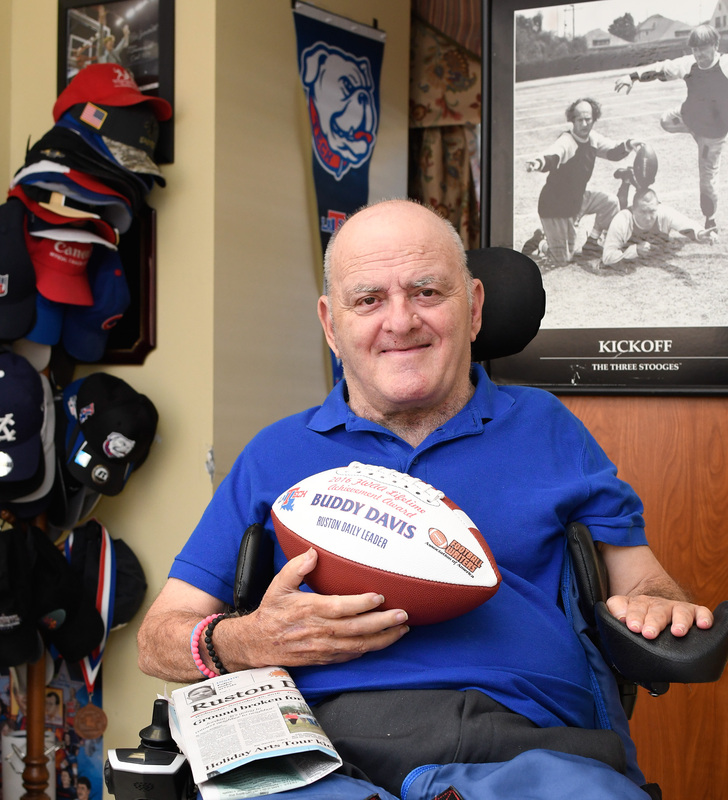 “Buddy” Davis, recipient of the 2016 FWAA Lifetime Achievement Award, was about to illustrate yet again his determination and spirit. And then he eyed his goal, inhaled, paused, hit the forward button and leaned into it. Forty yards and a cloud of rubber pellets later, he’d clocked an 18.79 — not much slower than he’d have run it before the summer of 2014 and the stroke and the fancy wheelchair. So he’s slowed down. But not much. The sports editor of the Ruston Daily Leader since pre-Watergate — 50 years and an estimated 43,000 bylines — Buddy has been a one-man show in an athletic community that’s long drawn a spotlight. A quarter of the members of the Louisiana Sports Hall of Fame — Buddy was honored with its Distinguished Service Award in Sports Journalism in 2009 — have Lincoln Parish ties. In 2010, this year’s FWAA honoree was even named Mr. Louisiana Basketball, even though he’s taller than 5-foot-7 only if he stands on his typewriter. “He plays like he’s 7-3,” said Northwestern State basketball coach Mike McConathy, one of the many All-Americans Buddy has covered in his role as a one-man sports staff, photographer and athletic almanac. Although there are occasional get-togethers in the house he grew up in and owns, Buddy’s main residence since the stroke is a Ruston assisted living center, Room 58. His friends refer to it as “The Jack Lambert Suite,” a nod to one of the greats on the Pittsburgh teams quarterbacked by Louisiana Tech’s Blond Bomber, Terry Bradshaw. Although he’s now limited to the use of his right arm and hand, Buddy still cranks out his weekly “O.K.’s Corral” Sunday column and 1,,500-word blog, still tweets and “Facebooks” and goes to as many Tech, Grambling State University, high school games and events as he can. ”As long as I can remember, back during my days as a young sports scribe coming out of Tech’s journalism department, I’ve been sending in my FWAA dues, reading the Fifth Down, voting on All-American teams, looking forward to receiving my directory and keeping up with my fellow members,” Buddy said. ”Hard to believe that the years since I mailed in my first membership dues have sprinted by faster than Lamar Jackson making it to the end zone again. Buddy is the one who made it most possible. He has been the perfect person in the perfect place at the perfect time.